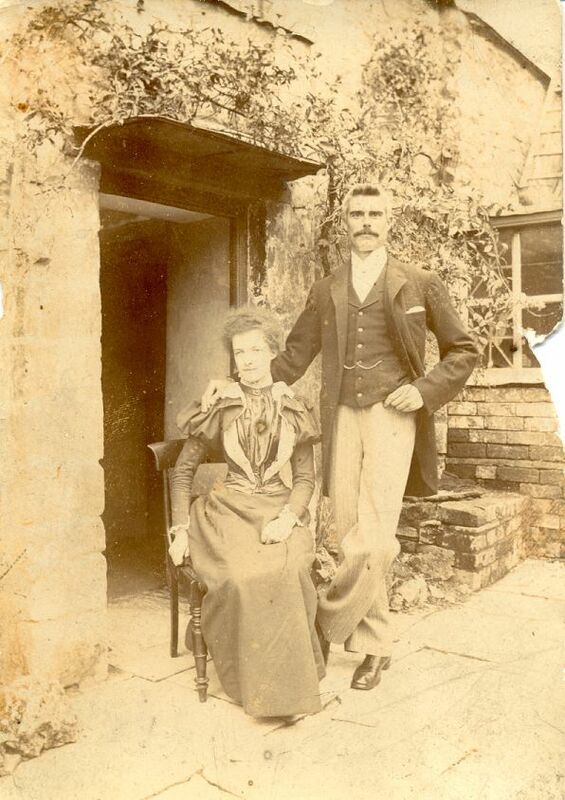 Martha Ellis was not a Campdonian, but was born in 1866 into a farming family in Staffordshire. As Martha Prince she worked as a cook-housekeeper to a banking family at Farncombe House and probably met Harry George Ellis when he was delivering game and fish to estates in the area. 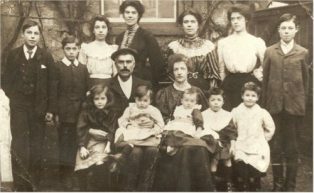 He was a widower from Campden whose wife had died in 1895, leaving him with four daughters and three sons, aged 6 months to 10 years old. Harry George, ‘HG’ as he was known locally, was ten years older than Martha and must have had considerable address in persuading her to take on the task of rearing the family as well as helping with his business as a fishmonger and game dealer. She was of strong enough character to cope with all this, as well as eventually having a daughter and five sons of her own. The first family gradually left home through marriage and emigration, leaving the second family for her attention. 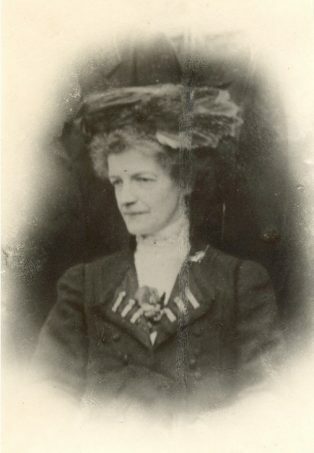 In 1900 ‘HG’ inherited his father’s basket-making business and Martha gradually took over the fish shop in the High Street. The basket shop, behind the fish shop, became a meeting place for local men and was where the Campden Morris was established. At the outset of WW1 ‘HG’ volunteered but being too old for active service was posted to Worcester to train the young soldiers. While he was away Martha ran the shop (now Drinkwaters) and on his return he became more involved in local community activities and so he ran the basket-making business and she managed the shop. During difficult times after WW1, shop customers could pay so much a week for goods. Upper-class homes had their own order books, goods were delivered and accounts paid monthly. Coming from the Staffordshire area, she decided to expand her range of goods by stocking china and hardware goods. Having one ofthe first motor vans in the area, a son would collect ‘seconds’ from potteries that she knew and rugs and hardware from Highworth, where she had relatives. Graham Greene’s wife once wrote while in residence in Hoo Lane, ‘the fish shop sells china on one side and flies on the other…’!! In the 1930s Michael Cardew arrived in a pony and cart with a variety of pots from Winchcombe Pottery and persuaded her to stock some in the shop. He and his wife came regularly with supplies. Martha had a reputation for some fierceness, especially with children shopping with their mum and they saw her wielding the heavy knife to fillet the fish and joint the poultry. She had favourite customers, mostly amongst the old Campdonians or elderly gentlemen who would enjoy an argumentative exchange of views. George Haysum, the bus and rail delivery source, was a favourite ‘enemy’, especially when the ice had melted from the fish delivery boxes on to the floor of his bus. I don’t keep fish, young man. I sell it. 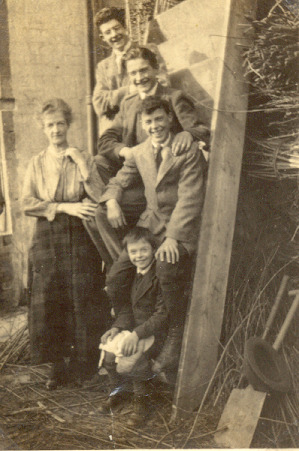 She was very fond of ducks and they wandered freely round the yard, feeding on fish offal and stale bread from James’ bakery, three doors away – their son, John James, told us much later, that they could never eat the eggs as they always tasted fishy – a story verified by Millie Coldicott, another favourite customer. Towards the end of WWII when bananas became available, the order was for children only but Mrs Ellis rebelled and kept them for the elderly. One local ‘lady’, who was a customer of a travelling Moreton fishmonger, sent her housemaid for bananas for her elderly husband, but received the reply – “that Mrs G. can get her bananas where she gets her fish”!! By the end of the War, regulations and restrictions and outside interests of the family became too much for her to continue and Campden, as elsewhere, was changing. Ellis’s shop, with all its memories, was sold in 1956 and the basket shop, where the Jazz Band was formed and the plans for the War Memorial were discussed, eventually became a dentist’s surgery.